Same as AICRO-NSF but with no label. Products without labels are not NSF Certified. AICRO is made Kemflo and used by many popular US companies as an original component in Reverse Osmosis Systems. AICRO-NSF uses Premium Coconut Shell Based Activated Carbon. 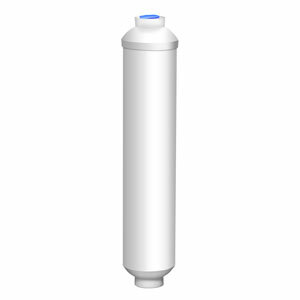 This filter is often used as a Reverse Osmosis (RO) inline post filter. It clips on to the membrane housing and filters the water after the bladder tank, acting as a polishing filter.